This cereal was described on the box as "a low-fat nutritional cereal for women". It was a combination of toasted wheat and rice flakes, corn flakes and vanilla almond oat clusters. General Mills announces the national launch of Harmony, an innovative new cereal developed to meet women's nutritional needs. One serving of low-fat Harmony cereal contains nutrients women need to stay healthy, including calcium, antioxidants, iron, and folic acid. It is also made with soy. "This new product is an easy solution for millions of women who want to find a simple way to nourish and nurture their bodies," said Megan Nightingale, assistant marketing manager for Harmony. "Harmony is a great-tasting cereal that's fortified with a combination of vitamins and minerals that women need." "It's no secret that women often don't get the calcium, iron and perhaps folic acid that their bodies need," said nutrition expert Roberta Duyff, MS, RD, CFCS and author of The American Dietetic Association's Complete Food & Nutrition Guide, which includes a chapter that specifically addresses women's nutrition needs. "It's great that a woman can now increase her intake of these important nutrients with a simple bowl of cereal for breakfast. And if you add milk, the Vitamin D in milk makes the calcium in both the fortified cereal and milk itself more absorbable." Research shows that women need to consume more of the nutrients found in Harmony. For instance, as many as 70 percent of women don't meet their recommended intake for iron and 90 percent of adult women do not meet the recommended intake of calcium, according to the US Department of Agriculture, 1994-96, Continuing Survey of Food Intake of Individuals. "Many women don't have the time or patience to remember all of the vitamins and minerals they need each day to stay healthy," said Duyff. "Harmony makes it easy. Simply pour yourself a bowl of cereal and you'll get many of the important nutrients you need." Harmony helps women meet their specific nutritional needs by providing a variety of nutrients they need each day. The cereal's name communicates balance and implies that the various elements of women's wellness - from the intricacies of a woman's body to her attitudes about health - are working in harmony with each other. Harmony boasts a delicious combination of toasted wheat and rice flakes, corn flakes and vanilla almond oat clusters. After a successful regional launch in the Northeast U.S. and portions of the Midwest, Harmony will be available nationally later this month. Suggested retail price for a 16.75 oz. box of Harmony is $3.69. 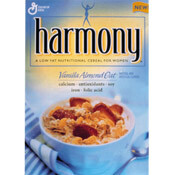 Harmony is a registered trademark of General Mills, Inc.
Time Magazine mentioned Harmony cereal in their June 17, 2001 issue in an article about food products targeted at women, "In January, General Mills climbed on board, introducing Harmony cereal with soy protein, folic acid and a vanilla-almond-oat flavor that rated high in female focus groups." Can I buy Harmony cereal or another similar cereal in Saint Louis, MO? I didn't like the way it tasted but I'm a guy so never mind. It's 2015 and I agree with everyone's comments. It was the best cereal I ever had, good tasting with nutrition specifically for women. 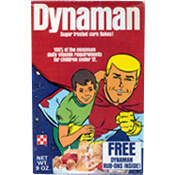 General Mills please bring it back!! I LOVE this cereal. I wish they would just please bring it back already. I have been looking like forever and can't find it. Yes... I agree.... bring it back. I've never had it and would like to try it! It's 2013 Bring it back. The woman in my family and I miss it. So freaking awesome. I guess they quit making it. I too have been searching for years to no avail... The best tasting cereal ever! I want Harmony back! It's nowhere to be found. Forgot about it. Remember it having a great vanilla-like flavor. I wish I could try it again. Great cereal. I miss it. I can't find it either! It'd be a real bummer if it's gone forever.